I fixed the Fuel placed in the ground bug, if you want to update download this version and just copy and replace the rocket.exe file. Also added altitude to the info. Left click to build beams and points, right click to delete. Fuel Lines are one-directional, they will pump fuel from the black to red. Ignition is also one-directional, make sure the triangle is pointing down. Thanks to everyone at the jam especially Sam for being my consulting rocket scientist, it was a lot of fun! I fixed a bug with the fuel lines, they were only applying force to the fuel particles without an equal force to the beam (@MysticalEric made a rocket that just used fuel lines to propel itself) , now fuel lines should work a lot better. I also added support for multiple hydraulic beams and a zoom to the in-game camera. So the particle collisions are actually what causes the propulsion, instead of just some magic physics force like in every other game? You should make particles disappear after some time cause when you do a full orbit your ship will just crash in the smoke and loose lot of speed resulting in an unavoidable crash. The smoke left over is pretty light and won't slow your ship down much, I've flown through it a few times, and it usually falls into the ground after one orbit. I probably will have it fade out in the next version though. Would you kindly fix fuel placing when you click the fuel button (i.e. underground)? Has anyone got to orbit with 2 tanks or less yet? My record is 3. Are you planning on adding destruction pyhsics in future updates? I fixed the fuel placed in the ground bug, I do want to add some more things like destructible beams and multiple stages but don't have much time to work on it right now. Due to the frictionless surface and atmosphere you can start your sideways burn at launch. Thereforem you can easily make orbit with one fuel tank by simply reaching 300m/s. Did someone say 2 stage rocket? I created a rocket that maintains the fuel pressure and gives a nice reading of the fuel left. 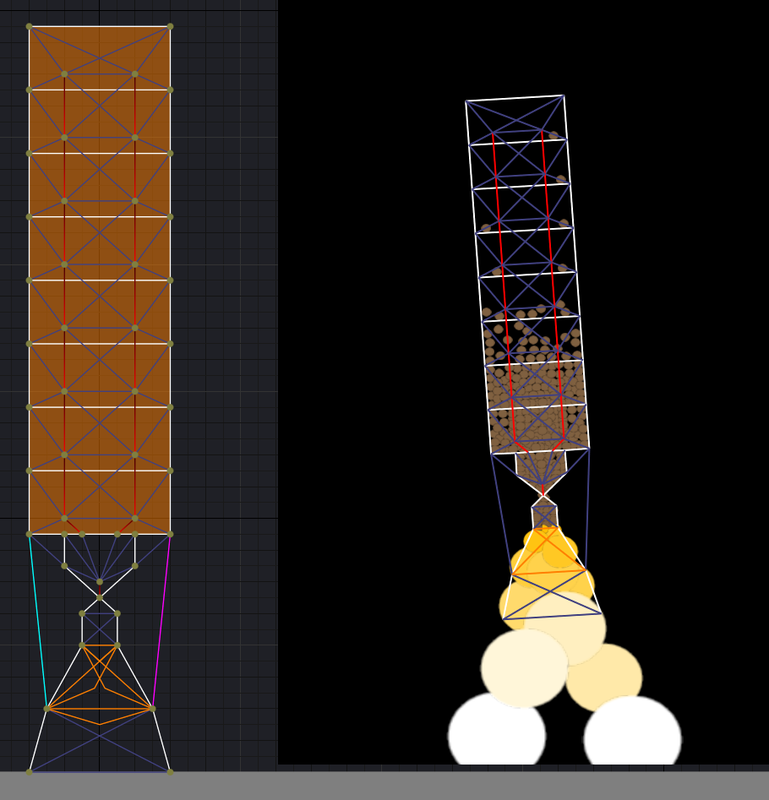 Is there any way you could add the functionality to be able to select and move groups of nodes/beams? Also, fuel lines seem to work backwards if you are pointing opposite your velocity vector, is there any way that could be fixed as well? Aside from those two things, I think the game is an awesome ton of fun! I'd really like to see you add the inverse square law to the gravity field so we get the orbits properly focused on the planets, but I believe you said that you want to do that when Scott Manley mentioned it. Oh, also, Wilhelm VonRoefelz, while yes, it is newton's second law that creates the force which propels the rocket, said force IS transmitted through the fuel particles. As they expand they push on each other and in turn push on the combustion chamber of the rocket engine, creating an change in the rocket's momentum equal and opposite to the change in the momentum of the propellant. Tsiolkovsky's equation plays no role in how forces propagate through the propellant to create a force on the rocket, it only describes the total achievable change in velocity of a given rocket, so don't bust it out just to sound smart. This is awesome, you should definitely add more to this rocket simulation. I spent the entire working day trying various designs and doing weird stuff to make the rocket either fly as far as 25.000 alt (I did manage to put one in orbit though) or having fun with fuel physics simulation in a rollercoaster-ish platform. May i sugest a few additions like a general purpose hydraulic and fuel line that we can assign to a key press ? This would allow for example to pass fuel from one stage to another. A segment separator line so that we can separate the rocket in two or more segments (disengaging rocket stages to make it lighter or simulating the release of an orbital satelite). Alow zoom/pan when following the rocket in the 5th view. Press a key to move the camera from one segment of the rocket to another when you break it into parts. Anyways, thank you for letting us try this builder ! Hi, I'm trying this at home but there seems to be a problem with Fullscreen 1920*1080 resolution. The view scrolls when i'm not even touching the borders (3/4 to the right or 20-50 pixels above the building menu. It's like if the scroll detection is based on a lower resolution than the full screen one. It works in windowed mode though. The builder doesn't appear to be registering my left clicks, leaving me unable to build anything when switching between rockets at all. I'm not going to say Scott Manley played this game because I suggested it in a Youtube comment, but Scott Manley played this game because I suggested it in a Youtube comment. Nice. Broke 40,000 today with a simple looking rocket. God this thing is addictive. That rocket is a mess but it does indeed fly that much high. the real challenge is putting one in orbit without consuming too much fuel. This game is awesome ! In my physics department we have a little contest about who would be able to send the rocket the highest. Currently the record older is me with 45615 of altitude and a max Y speed of about 936. Wonderful post!.Many people are afraid travelling in the sea or water because theres a high tendency of accident.That inviduals have their own travel insurance for their safety incase of sea accident. Thank you for this game. I really enjoyed it and i think now i am addicted of this game now. It needs a way to move a point. It would really help, so you can easily modify, without having to delete and rebuild so much. I don't know what equation you are using for gravity, but in real life, if you double the distance from an object, the gravity is 1/4 of what it was. You should seriously consider implementing that into the game. I just got into an orbit with only 1 tank of fuel! umm...whats with the wierd config file?